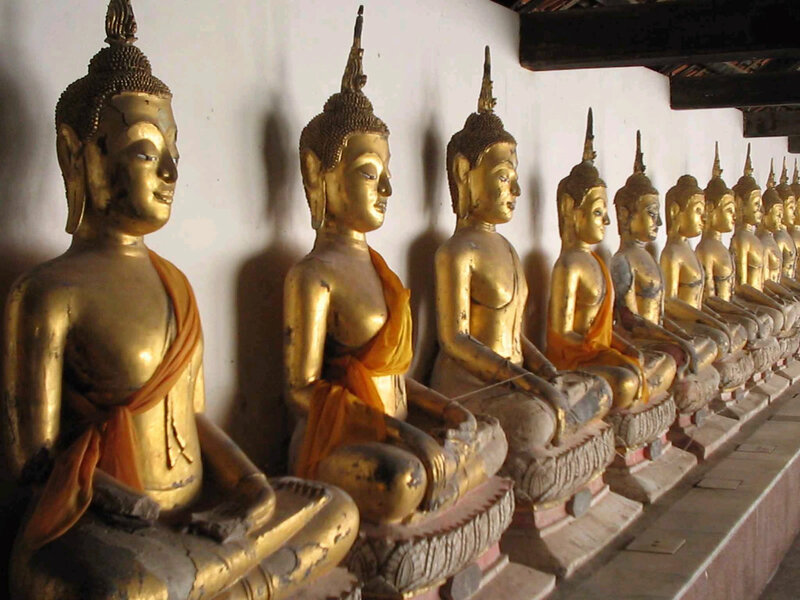 The four true realities taught by the Buddha are not as such things to “believe” but to be open to, see and contemplate, and respond to appropriately: by fully understanding dukkha / pain / the painful, abandoning that which originates it, personally experiencing its cessation, and cultivating the path that leads to this. These four true realities are the four fundamental dimensions of experience, as seen by a spiritually noble person with deep wisdom: the conditioned world, that which originates it, the cessation/transcending of it (the unconditioned, Nibbāna), and the path to this. Indeed, it is by insight into these that a person becomes spiritually ennobled. Thus have I heard. At one time the Blessed One was dwelling at Bārāṇasī in the Deer Park at Isipatana. There the Blessed One addressed the bhikkhus of the group of five thus: “Bhikkhus, these two extremes should not be followed by one gone forth (into the homeless life). What two? That which is this pursuit of sensual happiness in sense pleasures, which is low, vulgar, the way of the ordinary person, ignoble, not connected to the goal; and that which is this pursuit of self-mortification, which is painful, ignoble, not connected to the goal. Bhikkhus, without veering towards either of these two extremes, the One Attuned to Reality has awakened to the middle way, which gives rise to vision, which gives rise to knowledge, which leads to peace, to higher knowledge, to full awakening, to Nibbāna. “And what, bhikkhus, is that middle way awakened to by the One Attuned to Reality which gives rise to vision, which gives rise to knowledge, which leads to peace, to higher knowledge, to full awakening, to Nibbāna? It is just this Noble Eight-factored Path, that is to say, right view, right resolve, right speech, right action, right livelihood, right effort, right mindfulness, right mental unification. This, bhikkhus, is that middle way awakened to by the One Attuned to Reality, which gives rise to vision, which gives rise to knowledge, which leads to peace, to higher knowledge, to full awakening, to Nibbāna. “Now this, bhikkhus, for the spiritually ennobled ones, is the true reality which is pain: birth is painful, aging is painful, illness is painful, death is painful; sorrow, lamentation, physical pain, unhappiness and distress are painful; union with what is disliked is painful; separation from what is liked is painful; not to get what one wants is painful; in brief, the five bundles of grasping-fuel are painful. “Now this, bhikkhus, for the spiritually ennobled ones, is the pain-originating true reality. It is this craving which leads to renewed existence, accompanied by delight and attachment, seeking delight now here now there; that is, craving for sense-pleasures, craving for existence, craving for extermination (of what is not liked). “Now this, bhikkhus, for the spiritually ennobled ones, is the pain-ceasing true reality. It is the remainderless fading away and cessation of that same craving, the giving up and relinquishing of it, freedom from it, non-reliance on it. “Now this, bhikkhus, for the spiritually ennobled ones, is the true reality which is the way leading to the cessation of pain. It is this Noble Eight-factored Path, that is to say, right view, right resolve, right speech, right action, right livelihood, right effort, right mindfulness, right mental unification. “‘This, for the spiritually ennobled ones, is the true reality of pain’: in me, bhikkhus, in regard to things unheard before, there arose vision, knowledge, wisdom, true knowledge, and light. “Now on this, ‘This — for the spiritually ennobled ones, the true reality of pain — is to be fully understood’: in me, bhikkhus, in regard to things unheard before, there arose vision, knowledge, wisdom, true knowledge, and light. “Now on this, ‘This — for the spiritually ennobled ones, the true reality of pain — has been fully understood’: in me, bhikkhus, in regard to things unheard before, there arose vision, knowledge, wisdom, true knowledge, and light. And when the Wheel (of Vision) of the Basic Pattern (of things) had been set in motion by the Blessed One, the earth-dwelling devas raised a cry: “At Bārāṇasī, in the Deer Park at Isipatana, the unsurpassed Wheel (of Vision) of the Basic Pattern (of things) has been set in motion by the Blessed One, which cannot be stopped by any renunciant or brahman or māra or brahmā or by anyone in the world.” Having heard the cry of the earth-dwelling devas, the devas of the Four Great Kings raised the same cry. Having heard it, the Thirty-three devas took it up, then the Yāma devas, then the Contented devas, then the devas Who Delight in Creating, then the devas With Mastery in the Creations of Others, and then the devas of the brahmā group. pahātabban. In the Dasuttara Sutta (D iii 272-93), various other items are said to be things “to be abandoned”: “the ‘I am’ conceit”; “ignorance and craving for existence”; the three kinds of craving; the four “floods” — of sense-desire, existence, views and ignorance; the five hindrances; craving for the six sense-objects; the seven latent tendencies — to sense-desire, ill-will, views, wavering, conceit, attachment to existence, and ignorance; the eight wrongnesses — wrong view to wrong mental unification; the nine things rooted in craving, such as quarreling over possessions; the ten wrongnesses — wrong view to wrong mental unification, then wrong knowledge and wrong liberation. Dhamma is a difficult word to translate, but “Basic Pattern” captures something of what it is about: it is the nature of things as a network of interdependent processes, teachings which point this out, practices based on an understanding of this, transformative experiences that come from this, and Nibbāna as beyond all conditioned patterns. Dhamma-cakkhu. The arising of this marks the attainment of the first definitive breakthrough to becoming a spiritually ennobled one. Often it means becoming a stream-enterer, but a person may also go straight to becoming a once-returner or non-returner. Dhamma-cakka. “Wheel” is cakka, and vision or eye is cakkhu. Given their similarity, some pun may be implied here, especially as the Dhamma-wheel is only said to turn the moment that Koṇḍañña gains the Dhamma-cakkhu, vision of the Dhamma/Basic Pattern. Moreover, in Buddhist art, Dhamma-wheels sometimes resemble eyes. The Dhamma-wheel is set in motion in the instant Koṇḍañña sees the realities pointed out by the Buddha. It does not turn just from the Buddha teaching, but when there is transmission of insight into Dhamma from the Buddha to another person, thus inaugurating the influence of Dhamma in the world. This parallels a passage in the Cakkavatti-sīhanāda Sutta, where a divine wheel appears in the sky only when a Cakkavatti (Wheel-turning) ruler, who rules according to Dhamma — righteously and with compassion, ascends the throne, and it follows him as he moves through the world, conquering without violence (D iii 61-2). generally translated “monk,” but literally “almsman,” a renunciant living off donated alms. the upādāna-kkhandhas or grasping-aggregates/groups/bundles. These are material form (the body), feeling, perception, the constructing/volitional activities and consciousness, all of which we generally grasp at as “I.” In the above discourse, one might see “birth... death” as particularly related to the khandha of material form, “sorrow... distress” as particularly related to that of feeling, and “union... not to get what one wants” as involving activities and perceptions. All involve consciousness. The common translation of upādāna-kkhandhā as “groups / aggregates of grasping” is misleading, as only part of the khandha of constructing/volitional activities is actual grasping. The khandhas are the object of grasping, upādānā. Moreover, “upādāna” also means fuel, that which is “taken up” by fire, here the “fire” of grasping and the other defilements. “Bundles of grasping-fuel” captures both these connotations of “upādāna.” On this, cf. ch.2 of Thanissaro Bhikkhu, The Mind Like Fire Unbound, 1993., Barre, Mass. : Dhamma Dana Publications. The fuel-like nature of the khandhas is explicitly referred to at S iii 33-4 and M i 140-1 (MN 22 — just above “Well-proclaimed Dhamma” section), which compare the khandhas, as “not yours,” to grass, sticks, branches and foliage being collected to be taken away and burnt. S iv 19-20 (SN 35.28) describes the six senses, their objects, their related consciousnesses, stimulations and feelings as all “burning” with attachment, hatred and delusion and “with birth, aging, death; with sorrow, lamentation, pain, unhappiness and distress,” i.e., with causes of pain, and with things that are painful. taṇhā, which is not just any kind of “desire,” but demanding desire. Chanda, the “desire to do,” for example, can have wholesome forms which are part of the path. bhāvitabban: to be developed, cultivated, practiced. This term is related to bhāvanā, development, cultivation, practice. Citta-bhāvanā, or cultivation of the heart-mind, is a term for what is referred to in English as “meditation.” In the Dasuttara Sutta (D iii 272-93), various other items are said to be things “to be developed”: “mindfulness regarding the body, accompanied by pleasure”; calm (samatha) and insight (vipassanā); three samādhis — with both mental application and examination, with just examination, with neither; the four applications of mindfulness; the fivefold right samādhi — (which involve) suffusion of joy, of happiness, of mind (ceto-), of light, and the reviewing sign (nimitta); recollection of the Buddha, Dhamma, Saṅgha, moral virtue, liberality, and devas; the seven factors of awakening; the Noble Eight-factored Path; the nine factors of effort for perfect purity; the ten kasiṇas (e.g., colored discs) as meditation objects. devas refer to divine beings, especially those of the higher reaches of sense-desire (kāma-) realm that is seen to be the world shared by them, humans, animals, ghosts and hell-beings. The earth-dwelling devas and the following six types of devas in the above discourse are, in ascending order, the types of devas of the sense-desire realm. A māra is a tempter-deity, seen as seeking to keeping beings attached to sense pleasures. A brahmā is a divine being of the more refined realm of elemental form (rūpa-); beings attain rebirth at this level due to attaining meditative jhāna, which māras try to prevent happening. The devas of the brahmā group (brahma-kāyikā) are those of this realm of elemental form, the lowest of which are the devas of (Great) Brahmā’s retinue (brahma-pārisajjā). A Great Brahmā is a type of being who is full of lovingkindness and compassion, but with a tendency to deludedly think he created the world. The brahmās also include more refined kinds of beings. pariññeyyan. In the Dasuttara Sutta (D iii 272-93), various other items are said to be things “to be fully understood”: “stimulation that is with-taint and linked to grasping (phasso sāsavo upādāniyo)”; “mind and material form”; the three kinds of feeling; the four nutriments; the five bundles of grasping-fuel; the six internal sense-spheres; the seven stations of consciousness (types of rebirth); the eight worldly conditions — gain and loss, fame and shame, blame and praise, pleasure and pain; the nine abodes of beings; the five physical senses and their objects. samādhi, generally translated as “concentration,” does not refer to the process of concentrating the mind, but to the state of being concentrated, unified, in jhāna. the destruction of attachment, hatred and delusion, the cessation of pain/the painful, the unconditioned state. the path is noble (ariya) and transforms those who practice it into spiritually ennobled ones (see entry on this). Tathāgata is a term for a Buddha. It literally means “Thus-gone” or “Thus-come.” What is “thus” is what is real. Translating the term as “One Attuned to Reality” brings the term alive as referring to person who has awakened to the real nature of things, and experiences things as they really are, most significantly in terms of dukkha, its origination, its cessation, and the way to this. dukkha. The basic everyday meaning of the word dukkha as a noun is “pain” as opposed to “pleasure” (sukha). These, with neither-dukkha-nor-sukha, are the three kinds of feeling (vedanā) (e.g., S iv 232). S v 209-10 explains dukkha vedanā as pain (dukkha) and unhappiness (domanassa), i.e., bodily and mental dukkha. This shows that the primary sense of dukkha, when used as a noun, is physical “pain,” but then its meaning is extended to include mental pain, unhappiness. The same spread of meaning is seen in the English word “pain,” for example in the phrase, “the pleasures and pains of life.” That said, the way dukkha is explained in this discourse shows that it is here “pain” in the sense of “the painful”, that which is painful, i.e. which brings pain, whether in an obvious or subtle sense. samudaya-dhamma and nirodha-dhamma: here “dhamma,” the same word as for the Basic Pattern, is used as an adjective. One might also translate: “is subject to origination” and “is subject to cessation.” The words samudaya and nirodha are the same ones used for the “origination” and “cessation” of pain / dukkha. sacchikātabban, from sacchikaroti, to see with one’s own eyes, to experience for oneself. One is reminded of the epithet of the Dhamma as “ehipassiko... paccataṃ veditabbo viññūhi”: “come-see-ish... to be experienced individually by the discerning.” A ii 182 explains that the eight deliverances (vimokhas) are to be personally experienced (sacchikaraṇīyā) by one’s (mental) body; former lives are to be personally experienced by mindfulness (sati); the decease and rebirth of beings are to be personally experienced by (divine) vision (cakkhu), and the destruction of the taints (āsavas) is to be personally experienced by wisdom (paññā). The last of these seems that which applies in the case of experiencing the cessation of dukkha. In the Dasuttara Sutta (D iii 272-93), various other items are said to be things “to be personally experienced”: “unshakeable liberation of mind”; “knowledge and liberation”; knowledge of past lives, the rebirths of other beings, and of destruction of one’s taints; the “fruits” (-phalas) which are stream-entry, once-returner-hood, non-returner-hood and arahantship; the five dhamma-groups — of moral virtue, mental unification, wisdom, liberation, and knowledge and vision of liberation; the six higher knowledges; the seven powers of one who has destroyed the taints; the eight deliverances; the nine successive cessations — first jhāna up to the cessation of perception and feeling; the ten dhammas of the non-learner — right view to right mental unification, then right knowledge and right liberation. those who renounce the household life for a religious quest, and priests of the pre-Buddhist religion of India. “Renunciants” include Buddhist and Jain monks and nuns, and also certain ascetics who rejected Brahmanism and were Fatalists, Materialists or Skeptics. Ariya-sacca, usually translated “Noble Truth,” but K.R.Norman sees this as “the least likely of all the possibilities” for the meaning of ariya-sacca. He points out that the commentators interpret it as: “‘truth of the noble one,’ ‘truth of the noble ones,’ ‘truth for a noble one,’ i.e., the truth that will make one noble, as well as the translation ‘noble truth’ so familiar to us. The last possibility, however, they put at the very bottom of the list of possibilities, if they mention it at all” (A Philological Approach to Buddhism, London: School of Oriental and African Studies, 1997, p. 16). He prefers “truth of the noble one (the Buddha),” but acknowledges that the term may be deliberately multivalent. At S v 435, the Buddha is “the Spiritually Ennobled One,” but the term also applies to any of the ennobled persons (see entry on “Spiritually ennobled ones”). They are different from the “ordinary person,” the puthujjana, though an ordinary person can become a Noble person by insight into Dhamma. As regards the translation of sacca, this means “truth” in many contexts, but as an adjective it means both “true” and “real.” Taking sacca as meaning “truth” in the term ariya-sacca is problematic as in the above discourse it is said that the second ariya-sacca is “to be abandoned”; but surely, the “truth” on the origination of pain/the painful should not be abandoned. Rather, the “true reality” which is the origination of pain/the painful — craving — should be abandoned. Moreover, the discourse says that the Buddha understood, “This is the ariya-sacca which is pain,” not “The ariya-sacca ‘This is pain,’” which would be the case if sacca here meant a truth whose content was expressed in words in quote marks. The ariya-saccas as “true realities for the spiritually ennobled ones” are reminiscent of such passages as S iv 95, which says that, “That in the world by which one is a perceiver of the world, a conceiver of the world — this is called the world in the discipline of the spiritually ennobled one (ariyassa vinaye).” That is, spiritually ennobled ones understand things in a different way from ordinary people. Indeed, at Suttanipāta p.147, it is said, ‘Whatever, bhikkhus, is regarded as “this is true reality” by the world... that is well seen by the spiritually ennobled ones with right wisdom as it really is as “this is deceptive”’, and vice versa. Sn. p.148 then says ‘Whatever, bhikkhus, is regarded as “This is pleasant” by the world... this is well seen by the spiritually ennobled ones with right wisdom as “this is painful (dukkha)”’, and vice versa. This is because desirable sense-objects are impermanent and bring pain when they end, and because spiritually ennobled ones, unlike ordinary people, see the five ‘bundles of grasping fuel’ — the conditioned world — as painful. While ordinary people do not agree with this, or that ‘birth’, that is, being born, is painful, they may of course agree that, for example, ‘not to get what one wants is painful’. cakkhu means eye, but also vision, insight. © 2009 Peter Harvey. Transcribed from a file provided by the translator. Last revised for Access to Insight on 2 November 2013. “Dhammacakkappavattana Sutta: The Discourse on the Setting in Motion of the Wheel (of Vision) of the Basic Pattern: the Four True Realities for the Spiritually Ennobled Ones” (SN 56.11), translated from the Pali by Peter Harvey. Access to Insight (Legacy Edition), 2 November 2013, http://www.accesstoinsight.org/tipitaka/sn/sn56/sn56.011.harv.html .